For your innovations to succeed, they need to first be understood, then be loved. I can help you build a brand that’s both. Fast moving organizations don’t have time to throw the kitchen sink at every brand challenge. Together with a team of ace strategy, writing, and design partners, vs. Goliath provides focus to your brand and takes a systematic and creative approach to extending it across the right brand experiences. We start by uncovering hidden truths about your offering: who needs it and why yours beats the alternatives. It takes a combination of creativity and business acumen for new ideas to thrive in evolving markets. We bring both. We can craft each of your brand’s building blocks, providing consistent tools for spreading the gospel, whatever the medium. A brand comes to life though people’s ongoing relationship with it. We help you nail each experience. I’m a strategist with deep experience building brands that resonate in evolving markets like urban mobility, big data, and 3D printing. 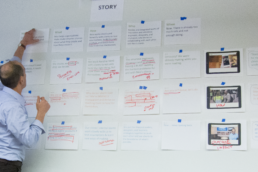 My knack for storytelling, simplifying complex ideas, and human-centered design has helped startups, government agencies, and Fortune 500 companies turn their smart ideas into strong brands. I combine in-house and agency experience to bring a unique perspective on how brand building impacts the bottom line and how to bring together multiple points of view into a cohesive strategy.